I love walking in the woods in the spring. No wearing three layers of clothing, no mittens to keep track of, no boots! I can just slip into my regular tennis shoes and a jacket, throw the dogs in the car and off I go. Unfortunately, when the snow melts the other thing that’s out in the woods besides me is garbage. I don’t mean beer cans, although there are a ton of those out there. I mean garbage like television sets, shingles, plastic containers, tires, diapers… Just crap, really. A whole ton of crap. I go from euphoria at being outside all the way to absolute fury at the way some people use the woods as their personal dumping ground. I wish there was a place where people could drop off all their crap. Oh wait! There is! It’s called a dump! But it costs money to take your crap to the dump or to have someone haul it away and it’s so much cheaper to drive down a two track out in the forest somewhere and throw it out there. I wish I had a superpower that would let me zap all the crap in the woods so that it would disappear from the forest and reappear in whoever’s house it belonged to. Right on their living room floor. Or maybe on their bed. Yeah! Take that, you littering litterer! Anyway, after walking the dogs I was so depressed at all the fresh garbage out there, I got out my pastels and painted a scene from another walk I’d taken recently with my family. A beautiful day on the Pere Marquette River, sun shining, water flowing, birds twittering. A gorgeous, gorgeous day. Of course, we also found snarled fishing line, bait containers and cigar wrappers along the banks. Wherever you find beauty I guess you can also expect to find evidence of thoughtless humans. We picked up what we could on the way out. I guess I’ll start bringing a garbage bag with me on my daily walks. It’s little enough, but it makes me feel a little better to at least clear the areas where I love to wander. Painting also helps. Although having a crap zapper superpower would be nice, too. This entry was posted in A pastel a day, Daily painting, forest, Manistee National Forest, river, Woods scape and tagged Marie Marfia, pastel painting, time lapse video on April 19, 2019 by Marie Marfia. Lately, I’ve been driving out to the state park in the mornings before I settle in at the office. Today it was raining but I just parked in front of some dunes, rolled down the passenger side window and zenned right out. Rainy Day, 9×6″ pastel on sanded paper. ©2019 Marie Marfia. This painting will be available on eBay starting tonight at 9pm. Ten percent of the proceeds from each of my auctions goes to benefit AFFEW, a local group dedicated to saving the planet. This entry was posted in A pastel a day, beach, ebay sales, painting a day, Pastels, plein air, seascape and tagged art for sale, Marie Marfia, painting for sale, pastel painting, plein air painting on April 16, 2019 by Marie Marfia. This is a small pastel on paper I did this morning. My “usual” spot on the porch didn’t look too promising so I turned 180 degrees and painted what was behind me. You can see by the photo what I was working on. I like the feel of this piece and all the rest of the pastel I’ve been doing while staying here in Tucson. Working outdoors forces me to work quickly which I like and the work is much looser than anything I can achieve in the studio. 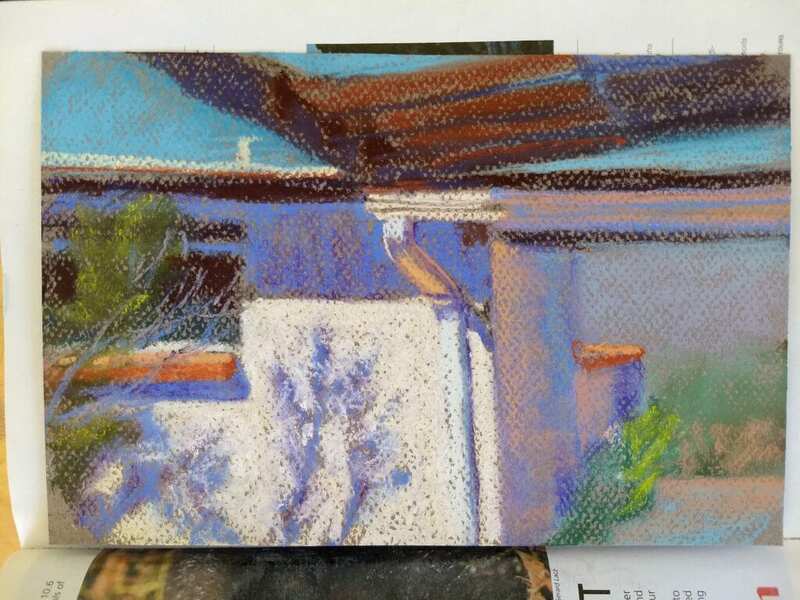 This entry was posted in A pastel a day, Landscape, painting a day, Pastels and tagged Marie Marfia, pastel painting, Southwest on March 25, 2019 by Marie Marfia. My husband and I are camping on a friend’s property for a week or so here in Tucson, AZ, and I’m taking the opportunity to paint horses! This morning’s effort is a painting of a horse eating her breakfast in a small paddock. I have always liked horses as subject matter, although I was never a riding enthusiast growing up. That said, when I was twelve or so, my sister and I pedaled our bikes for miles to a small farm every Saturday where we’d ride ponies all day long, stopping only for lunch. The farm belonged to Mr. and Mrs. S., friends of our parents whose kids had long since moved on to mini-bikes. They were happy to have us exercise the ponies. I didn’t much care for the long bike ride, although I’m sure my mother felt I needed the exercise. Mary probably would’ve have biked three times as far for half the riding time. She was crazy about horses. I remember the air was hot and full of buzzing deer flies. We rode along mini bike trails out in the piney woods for hours. Socks was a dapple grey, the smaller of the two, and she took good care of me, patiently putting up with my considerable lack of riding skills. My sister’s mount was another matter. A beautiful appaloosa, Gepetta was almost horse-sized, very smart and an opportunist, as she regularly tried to buck Mary off at the first available sandy patch on the trail, sometimes successfully, sometimes not. Once while we were eating sandwiches at the house, Mr. S. happened to overhear us telling Mrs. S. about Mary getting dumped. Mary hadn’t been hurt by the fall and we’d just followed Gepetta back to the house as usual and planned to go out again after lunch. But Mr. S. immediately went outside to where the ponies were hitched, and picked up Gepetta and threw her onto her back, saddle and all. She scrambled back up and stood there, shaking, while he yelled at her. Gepetta never bucked Mary off again, but I think Mary would’ve died before she’d have ratted Gepetta out to Mr. S. again anyway. Eventually the ponies were sold or maybe I refused to bike over there, I can’t remember how or why we stopped going. Mary continued to find horses to ride, I continued to accompany her when she pestered me into it. I never have been a confident rider and in general I prefer to paint them, although our friend here put me up on her horse Easy last night and it was sweet. He’s a patient horse, too, very gentle, just how I remember Socks. 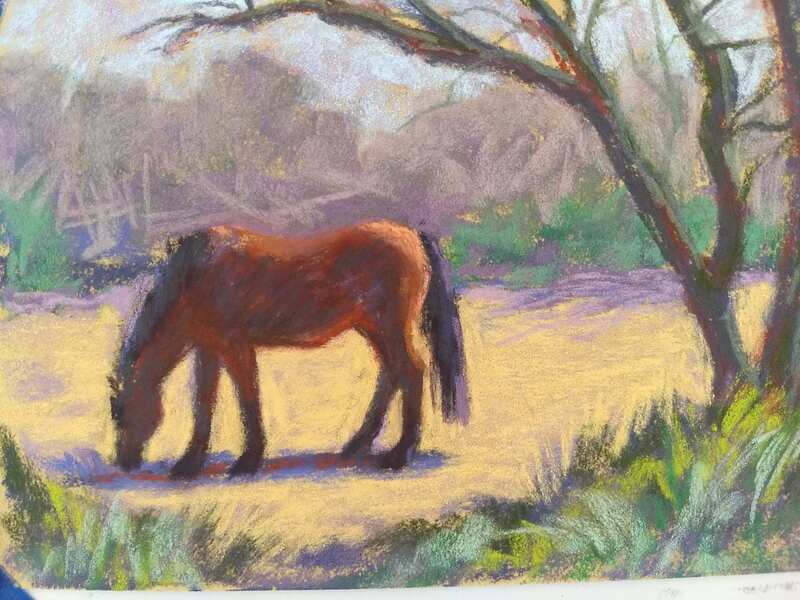 This entry was posted in A pastel a day, Animals, Daily painting, painting a day, Pastels, Uncategorized and tagged art, art for sale, daily painting, horse, Marie Marfia, pastel painting on March 18, 2019 by Marie Marfia. 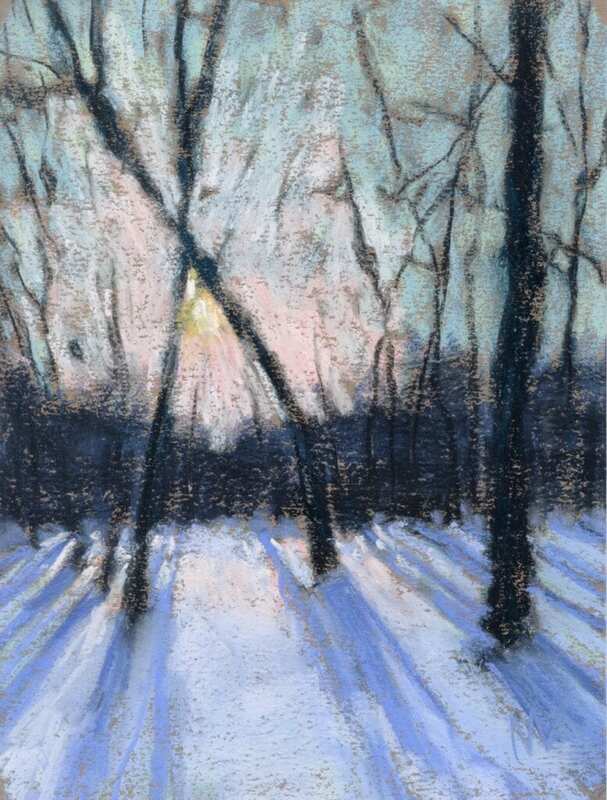 Late Winter Sunset, 6×8″ pastel on paper by Marie Marfia ©2019. This painting is available for a short time on eBay. Click the link below to bid. Sunsets in winter time are so full of drama! Dark clouds! Orange and yellow reflections! So pretty. I love it here. This painting is for sale on ebay. When you bid on this painting you’re helping me contribute to AFFEW, a local environmental organization. Thanks for your support! This entry was posted in A pastel a day, beach, ebay sales, painting a day, Pastels, seascape and tagged art for sale, beach, Lake Michigan, pastel painting, sunset, winter scene on February 26, 2019 by Marie Marfia. 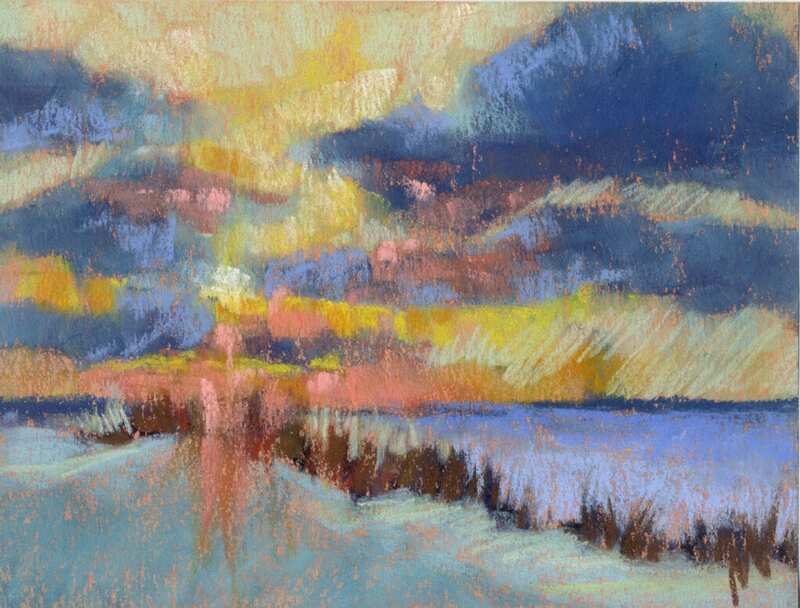 Winter Sun 6×8″ pastel on paper by Marie Marfia. This painting is available for a short time on ebay. Click the link below for more information. Another glorious sunrise out in the Manistee National Forest, my favorite place to be in the morning. This entry was posted in A pastel a day, Daily painting, ebay sales, forest, Landscape, painting a day, Pastels, Woods scape and tagged art for sale, forest, manistee national forest, pastel painting, woods on February 24, 2019 by Marie Marfia. Winter Path to an Inland Sea, 9×6″ pastel on paper of a path through the dunes to Lake Michigan by Marie Marfia ©2019. This painting available on eBay. Click the link below to find out more. This painting is from a walk along the beach in the middle of Michigan winter. I love this time of year because there is so much drama. It’s a beautiful time to visit the beach! This entry was posted in A pastel a day, beach, Daily painting, ebay sales, Landscape, painting a day, Pastels, path, seascape and tagged art for sale, dune grass, dunes, Lake Michigan, Ludington, pastel painting, seascape, seaside, state park, winter, winter scene on February 19, 2019 by Marie Marfia. Winter Dune Grass, 9×6″ pastel painting on Canson paper by Marie Marfia. This painting is available on eBay. Click the link below for more information. This painting is from a walk along the Lake Michigan shoreline during winter time. The snow peeks in and out of the grasses which are blowing in the wind. You can see the lake under dark clouds. One of my favorite times of year. So much drama! 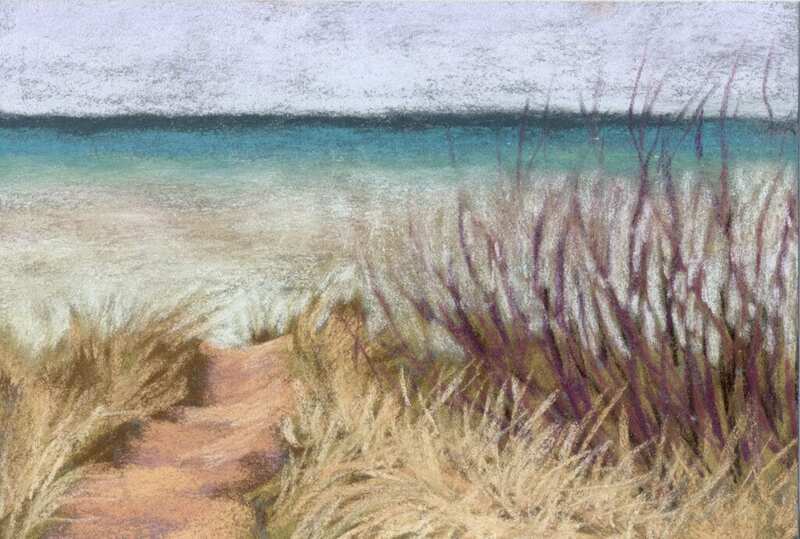 This entry was posted in A pastel a day, beach, Daily painting, ebay sales, Landscape, painting a day, Pastels, seascape and tagged beach, dune, dune grass, Lake Michigan, Ludington, Michigan, pastel painting, shoreline, state park on February 18, 2019 by Marie Marfia. Big Dune, 9×6″ pastel painting of a beach dune with grass and snow by Marie Marfia ©2019. This painting is available on eBay. Click the link below. Last weekend during a break between snow storms my husband and I went out to the state park and walked along the shore for a bit. It was so pretty out there. I love how the beach grass reflects the last light of the day and how the snow peeks out between all the clumps. It’s beautiful here. This entry was posted in A pastel a day, beach, Daily painting, ebay sales, Landscape, painting a day, Pastels, seascape and tagged art for sale, beach, beach grass, dune, Ludington, pastel painting, snow, state park, winter on February 16, 2019 by Marie Marfia. Sometimes you don’t have to go any farther than your own front yard for inspiration. Glinda had it right! Click to bid on this painting! This entry was posted in A pastel a day, Daily painting, ebay sales, Landscape, Manistee National Forest, Old (Dead) Masters, painting a day, Pastels, Woods scape and tagged art for sale, forest, manistee national forest, pastel painting, sunrise, woods on February 15, 2019 by Marie Marfia.